at the beginning of December. The organization has found the right formula for a successful festival – authentic German and Texas entertainment, food, and beer; vendors with unique offerings; carnival and kids’ activities, plus free admission and no hassle-parking with free shuttle service. All of these aspects are listed in reviews on the Tomball German Festivals Facebook page, which has 30,000 followers. But so is this – the friendliness of the volunteers, vendors, and entertainers. It comes across that they are having just as much fun as they want you to have. “Loved it! Food is amazing, the staff down to shuttle drivers, all amazing!” said one post. “It's worth all the festivities, music, food, drink and many merchants that sell there! It's a reflection of the city of Tomball and the quality of life there!” said another. also recently did an interview with People magazine, so watch for that story. You’ll soon have the chance to experience all this warm Gemütlichkeit German-Texan hospitality at the 10th Annual German Christmas Market on Dec. 8-10. To celebrate the event’s 10th anniversary, the Sister City Organization is proud to announce the Squeezebox Band from Ohio will headline all three days. The band features America’s Polka Sweetheart Mollie B, Accordionist and Music Producer Ted Lange, and Drummer Dana Lindblad. Enjoy folk dancing by the Rathkamp German Folk Dancers, Keine Kunst German Folk Dance Troupe, high school German clubs, and local clogging groups. 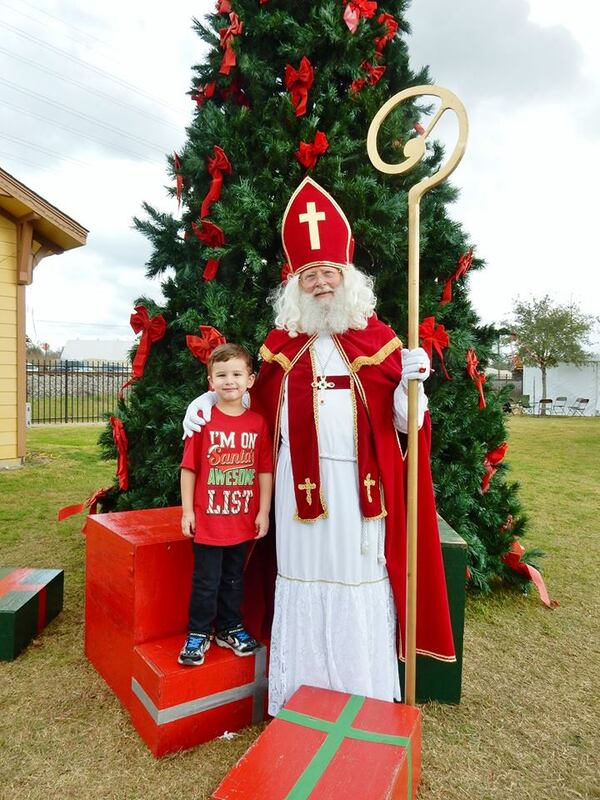 Sinterklaas (the original Dutch Santa) and Kristkind (German folklore “angel” who delivers presents to children) will be strolling the marketplace, along with Ghillie the Elf, dancing Christmas tree, and Santa Claus himself. These characters welcome free photo requests, so bring your camera. James, Rebecca Huck, and Joe Brikha will keep you in the Christmas mood. or a warm cup of glühwein (mulled wine). Kinderfest (kid’s area) will provide entertainment and fun for the young visitors. It includes carnival rides, bungee jump, rock wall, petting zoo, pony ride, walk on water, and more. red cabbage, schnitzel, and apple strudel (one Facebook post declared the strudel “godly”). The menu also features festival foods like funnel cake, corn dogs, hot dogs, hamburgers, kettle corn, and barbecue. In Europe, the Christmas markets are open for the month-long holiday season. “They are the place to go after work, during lunch, or to gather with friends to celebrate Christmas before the big holiday,” explained Valina, who has been on the Tomball festival scene almost since the beginning, performing in her parents’ Dutch dance troupe when the first spring festival was held 18 years ago. She has gone on to become an emcee and entertainment director for the festival, and performs with her husband, Ross, as Das Ist Lustig. Oh, and she’s also the dancing Christmas tree. “I like how the Tomball German Christmas Market has become a place where families and friends can gather together and celebrate the Christmas season, just like they do in Germany! You get some shopping done, you dance to the music; you taste the glühwein. Sometimes you see people exchanging gifts with each other,” she said. company, Oktoberfest Depot, has been a vendor for the past seven years. Tessy Crawford and Billie Stripling welcome you to the TSG tent, which now has a permanent placement under the big oak trees across from the community center and within earshot of the Chris Rybak Party Stage. “I personally love all of the PEOPLE! Everyone is there to have fun and SHOP!” Tessy said. “I love the festive Christmas atmosphere and the cooler weather,” Billie added. To add to the festive atmosphere, the Sister City Organization offers prizes to vendors for Best Decorated Booths. 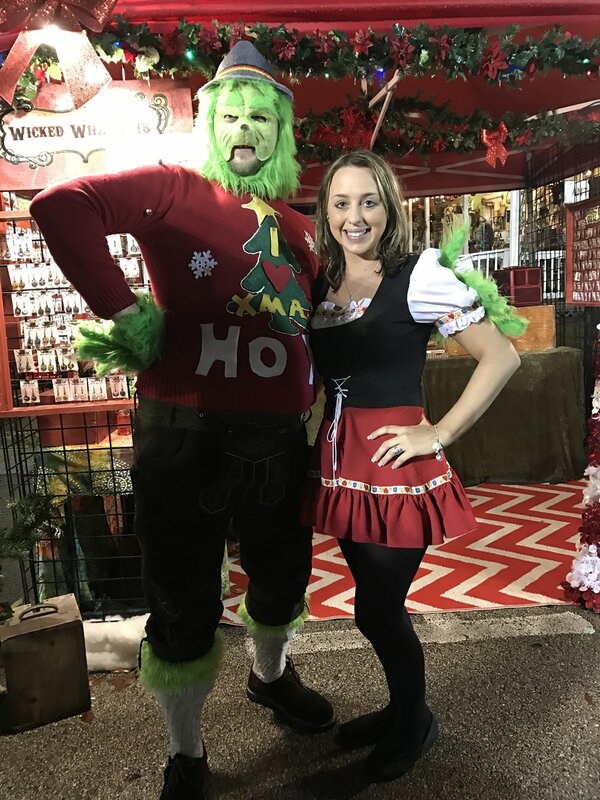 Last year, Wicked Whatnots of Texas out of Round Rock took first place and the $300 prize for its décor, complete with co-owner Austin O’Burke as The Grinch. Local children's choirs and church groups entertain with Christmas music. Some of the bands play traditional Christmas music of Germany and Austria, while others cover the seasonal party songs. to share a stage with an Andean flute player. He never complained and, he and Edita, along with Valina and Ross, have become part of our festival family,” Grady said. Chris has developed quite a following at the festivals. "We used to always party until security came to shut it down,” Chris said. “And then we would do one more song of God Bless America and of course made it into a never-ending polka medley. The crowd always went wild and we were the last stage going. So Grady thought it was appropriate to name our stage the Chris Rybak Party Stage!" "We play at many, many festivals through the year, but no one treats you better than Tomball,” said Edita. “Whether you are a musician, vendor, or just a German patron for the day who just happens to be wearing the new lederhosen or dirndl that you bought at the Kuckuck's Nest five minutes before, Tomball always treats everyone as a friend and part of the family. It doesn't get much better than this!" Accordionist Kenny James is not affected by the weather as he performs in the Weihnachtshaus located inside the community center. “Tomball’s country setting and relaxed atmosphere make this one of my favorite festivals to attend. The revelers are appreciative and fun to play for,” said Kenny, whose relationship with the spring and winter festivals goes back more than 13 years. Grady said the Sister City Organization is always looking for ways to enhance the German-Texan experience at the festivals. That was the thinking behind bringing in nationally known, Grammy-nominated Alex Meixner to the spring event each year, which polkabeat.com is proud to sponsor. at the time. With the leadership of Tomall Mayor Gretchen Fagan, the city has embraced what the Sister City Organization works to accomplish. “We want the festivals to make Tomball a destination,” Grady said. “The events fill up the hotels and people enjoy our antique shopping and world-class restaurants.” Now, thousands attend both festivals, and between 200 and 300 kegs of beer are tapped at the Christmas market alone. And as Grady is fond of saying, you don’t have to be German to attend! WHO IS THIS SISTER CITY? The Tomball Sister City Organization is a nonprofit corporation formed for the purpose of the establishment, sponsorship, promotion and support of cultural, business, educational, diplomatic, and other exchanges with Tomball’s sister city – Telgte, Germany. noticed the many similarities between Tomball and Lula’s hometown. Germany. It was founded in 1238 and is well known for its beautiful medieval architecture. Telgte is situated in the middle of Germany's “horse country,” and Tomball reportedly has the highest horse population per (human) capita in the United States. The cities also sponsor a student exchange program. Fifty-six German students have stayed with host families in Tomball so far, and eight Texas students have taken advantage of the program. The German students attend one of two of the high schools in Tomball for one school year. Three male students are here now and are enjoying playing football. Tomball first responders and senior citizens whose homes were damaged.